AA Similarity Postulate-If two angles of one triangle are congruent to two angles of another triangle, then the two triangles are similar. A baseball team wanted to make pennant and wanted to make bigger pennants for the adults and smaller pennants for the children. They wanted the triangles to be similar. They took one big and one small pennant and measured their angles. The bigger pennant (triangle ABC) and the smaller one (triangle DEF). 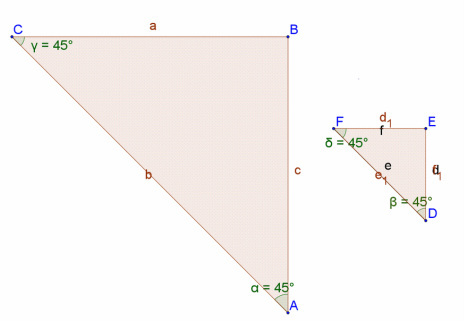 <A=<D and angles F and C are both 45 degrees. Are these triangles similar? ANSWER: yes because two of their corresponding angles are equal to each other.